Since 1982 Lee Reclaim have been specialising in inert construction and demolition waste management. Offering a complete package to manage inert waste, our landfill site is conveniently situated off the A612 in Hoveringham (between Lowdham and Southwell), Nottinghamshire. We are open Monday to Friday 8.00am to 5.30pm and by prior arrangement on Saturday mornings. We accept for recycling: construction waste i.e. bricks, concrete, tiles & ceramics, soil, topsoil, tarmac. 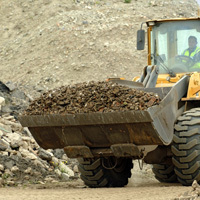 Inert subsoils and clays are also accepted to licensed landfill for restoration works on site. Concrete and masonry reclaimed from demolition works is crushed and screened at our recycling facility using modern crushers and screens, and can provide the following recycled aggregates and mixtures (fills) adhering to the WRAP protocol: 25-50mm brick/concrete (6F2), crushed brick/concrete and screened soil (reclaimed). Now available - quarried aggregate: grit sand, MOT type1 stone, ballast.